Popovers are soemthing I never ate and saw only, uhm, maybe twice. So I have no idea if what I made turned out right. As I am completely clueless I followed the recipe (almost) completely. Because the recipe did sound a bit odd, I sprinkled some grated lemon zest over the dough and exchanged the melted butter for lemon infused olive oil. But I was very carefully with it, so in the end it was not enough to make a difference in taste. The recipe is maybe the fastest and easiest I ever made. 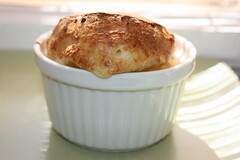 I don't have the right form for it so I used soufflé-forms. This is a very basic recipe. To me, it was a bit boring in taste. I ate one as it was straight out of the oven. What made it special was the warm dough. The second one I ate cold and with some vanilla pudding and sour cream. Like that, it was far better. I can imagine these more on a savory side. No idea, if that's "appropriate" for popovers (are popovers sweet? or savory? or both? - no idea...). But for me, a spice-loaded version could make a very good starter with a cold Rosé in the summer. 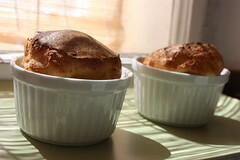 If you like popovers than this recipe is for sure perfect - quick, fast easy. Find out more about it on our hosts blogs: Paula of Vintage Kitchen Notes and Amy of Bake With Amy. Or buy the book and go to p. 213. PS. : Even if this is not the most overwhelming recipe I ever made I am really glad the group picked it. Doing my favourite recipes over and over again is something I can do on my own - baking with the group means trying something new! Interesting adding olive oil, never thought of doing that. Thanks for baking along today! I think these could be sweet or savory. I grew up eating them on Sunday with roast. I love them with gravy in the hole! I am glad you will try it again. Popovers are whatever you want them to be. Sweet, savory--you decide. They are fun! Too bad the lemon flavor did not come through like you expected. It sounded wonderful. These can be pretty much anything you like, savory or sweet. Hmmm... maybe if you added lemon zest directly to the batter itself if that would impart more of a lemon flavor ~ which I would truly love! It looks like they came out perfectly. The olive oil was a nice idea.